Russian fast casual chain Teremok opens its first restaurant in New York. Popular Russian fast casual chain Teremok is launching its first restaurant in New York, right near Madison Square Garden. Will Teremok’s owner Mikhail Goncharov manage to become a success on a new market? Yes, blinis can be fast food too. 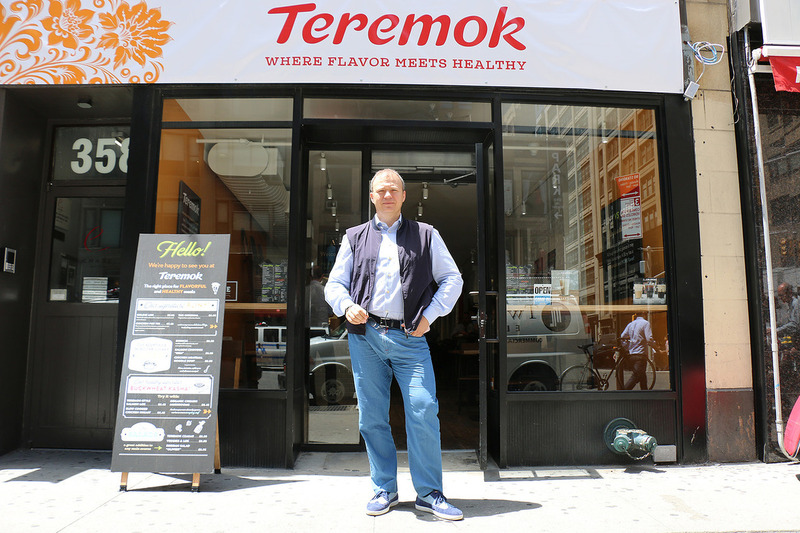 On June 14, Russian fast casual chain Teremok opened its first restaurant in New York, at 358 7th Avenue. In Russia, Teremok has managed to successfully combine traditional Russian dishes with the fast casual format and spread all over the country, where it has some 280 restaurants. Its menu offers traditional blinis with a variety of fillings, including red caviar, soups, kasha, pelmeni and salads. Its food, prepared in front of customers, is familiar to anyone born in Russia. Expats in Russia have different impressions of Teremok: Some are indifferent, while others have fallen in love with its blinis and kashas. Nathan Stowell, a member of a Moscow expat community on Facebook, was less enthusiastic: “Like eating a piece of cardboard soaked in butter,” he said. How to get Americans interested in blinis? The main challenge for Teremok in the U.S. is a target audience that the chain has little experience of. Furthermore, its main offering – blinis – are not very familiar to local customers. Russian experts advise that the chain should start its promotion among Russian immigrants. “In the case with Teremok in New York, its first customers will be local Russians. It will guarantee commercial stability to begin with,” said Roman Glubovskikh, development director with the research agency Indagate. “Let’s not forget that NY has one of the biggest Russian communities and the city enjoys a stable economy and a highly-developed restaurant scene. The choice of location is very good indeed,” said Glubovskikh. Press photoRussian fast casual chain Teremok opens its restaurant in New York. Teremok founder Mikhail Goncharov plans marketing support for the first six months: “If there is demand, we shall look for new locations and keep opening new restaurants, as we have been doing in Russia for the past 18 years,” he said. Vladimir Mukhin, chef at the White Rabbit restaurant in Moscow and brand chef at White Rabbit Family (No. 18 on the list of the world’s top 50 restaurants), is optimistic about Teremok’s prospects on the U.S. market. “Blinis is a new format of fast food for the Americans, and they have always been fond of fast food. So there’s no doubt that Teremok will be greeted with interest. And then customers will discover that this food is also delicious. Blinis are our secret plan to conquer America,” he said. Teremok is not the first Russian chain to enter the U.S. market this year. March saw Dodo Pizza launch its first American outlet in Oxford, Mississippi. Over the next 10 years, Dodo Pizza intends to open 400 restaurants in the U.S., both its own and as a franchise. The company’s founder Fyodor Ovchinnikov says that selling pizza in America is easier than selling blinis: “We are not making a Russian pizza. We are only making a product that Americans are familiar with, but we are making it in a new way,” he said. “However, Teremok will have to explain to customers what blinis are. Having said that, I don’t think anything is impossible,” said Ovchinnikov. According to chef Sergei Kuznetsov, there is nothing particularly unique about Russian blinis in terms of their recipe: “Blinis are present all over Europe, take France for example. Nowadays, there are even cakes made of blinis. On the other hand, people in America are fond of experiments, so it may work,” he said. Teremok’s founder Mikhail Goncharov is confident of success on the American market: “If you take long-established concepts and market leaders, no-one has any particular advantage. The leaders are approximately at the same level,” he said. “If somebody had some unbelievable advantage, their company would double in size every year. Since this is not happening, that means that no-one is enjoying any particular advantages,” said Goncharov.